Ace your preparation for the skills measured by MCP Exam 70-284 and on the job with this official Microsoft study guide. Work at your own pace through a system of lessons, hands-on exercises, troubleshooting labs, and review questions. 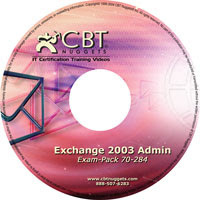 Maximize your performance on the exam by learning how to: Plan, install, and configure an Exchange Server 2003 infrastructure Migrate from Exchange Server 5.5 and other messaging systems Implement encryption, virus protection, and other security services Manage recipient objects and address lists Monitor and troubleshoot servers, clusters, data storage, and connectivity Troubleshoot Active Directory operations and other supporting technologies. Also practice from the vce practice test. is the videos and the actual test papers are enough for passing the paper?please answer it as soon as passible. New CBT links has been added.